lex-man wrote: I've just finished the next section Unity Game Development course I'm working through. It's taking me ages though and I'm not actually sure that I really want to make games anymore. I thinking about trying to get into Vertical Farming. Is that one of the Udemy ones? Yeah, I've been at it for almost a year now I think. Ha. I'm about a third of the way into the C#/Unity one and it's going reasonably well. Still super basic though...I take it from your reaction that it gets...tougher? Not really they've started using a lot of prefab stuff. So in the few lessons you basically have a working FPS game. Well you can walk around a terrain, there is grass, trees and a zombie. Although there are now weapons or health stuff set up. I think I'm just getting a bit annoyed with how long things are taking. I think the best way to continue would be to take a week off by myself and just try and work on stuff like it was a job. I just generally losing interest in the game development process. I like programming but Unity seems more foucsed on dragging and doping stuff. Still going to finish this course though. EDIT: I guess my problem is that I don't really see game development at a decent career path. The market seems over saturated with games and it seems all but impossible to make something that enough people will buy to sustain myself. Honestly I’m not sure slogging through a course is the best approach. Start making a game and learn new things as you go along, that way the creative process doesn’t disappear. Get a simple idea, put a character or whatever on the screen and work on getting it to move in a way that is fun for the player. Build from that. You don’t need to know everything up front - I sure as hell didn’t and still don’t. I learnt loads making my first game, now onto my second there is so much I’m doing differently and better; just through experience. Make and create and the learning happens along the way. Regarding Unity, it can be anything you like - which is its strength. Use assets only when they take the slog out of something. Code everything yourself that you want to feel unique and creative. e.g I’m using a UI asset to speed up building menus etc but I chose this one because I can code stuff into it myself as well. All the leg work is handled by the asset, but it hangs together with polish written in by my own code. Yeah, I'm feeling that. My trajectory at the moment is writing in games rather than coding, but I get the same feeling...there are people out there who have been actively trying to break into that side of the industry for 10+ years and are still stuck making free itch.io games. It seems you've either made it or you haven't, with the latter outnumbering the former by a magnitude of several 100%. It can be dispiriting, is what I'm getting at. Thanks man, I really want to finish this course though as I've been at it for so long. Really don't have much more to get through, now. That said if I had done the course properly I should have stopped and maybe my own game after each section. Personally my interest in Unity and the like is very much from a hobbyist perspective. I enjoy coding and creating things and this gives me an outlet to use (and potentially improve!) those skills that ties up with my love for computer games. If I make something fun out of it then I'll share it and maybe even see if I can benefit financially from it, but I'm not planning on it becoming my day job as I already have one of those that I quite enjoy - plus whilst I certainly don't earn mega-bucks right now I still think it would be hard to get to a position where a role in game development offered as much in terms of both pay and long term security! Jenuall wrote: Personally my interest in Unity and the like is very much from a hobbyist perspective. I enjoy coding and creating things and this gives me an outlet to use (and potentially improve!) those skills that ties up with my love for computer games. I don't want to become rich but I'd like to come self dependent from doing it. Not sure it'll ever happen though. Just finished the next section of the course. Just have two more to do now. Hopefully will actually finish pretty soon. I'm onto the last section of my course. It's actually been pretty interesting. They really picked up the pace in the final parts as it shows you one thing per section rather than trying to make a game. So the last section just looked at setting up multiplayer stuff. lex-man wrote: I'm onto the last section of my course. It's actually been pretty interesting. They really picked up the pace in the final parts as it shows you one thing per section rather than trying to make a game. So the last section just looked at setting up multiplayer stuff. Cool Lex! So what game idea is on your mind to make? I'm not actually sure. My first idea was to make a simple single screen 2D shooter but I'm starting to think that's too simple, based on what I've done so far. I'm not thinking of making a game called 100 mascots which would be battle royal game but based on Mario style controls and on a far smaller map. I kind of think that would be too complicated ATM though. Interesting concept! I’ve kind of shied away from platformer mechanics because they’re notoriously hard to get right and will always be compared to something like mario. There is a lot of opinion on the subject! Currently working on REVAROUND with Huey Games. It’s a multiplayer team based car game with elements of Speedball, Rocket League and Breakout. Had it’s first live play test in Manchester last night. Let us know what type of game you decide on. First play reaction of my new game. Happy with that! 1) Almost all game sprites/tilesets are sized at multiples of 8 (with 16x16 most common), but that's almost entirely for legacy reasons. 2) 12 has more factors than 16 which leads to more interesting symmetries. More specifically 12 can be divided perfectly into thirds, which 16 can't, and you can see where I've used this in the grass and in the small building roofs. 3) The smaller size means 112 less pixels to work with than the standard 16x16, which I thought would be an interesting limitation to try and still capture Link's Awakening's style in. 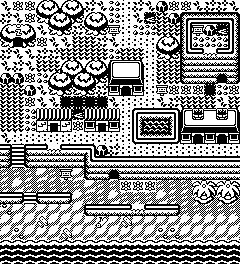 What drawing software are you using for the tileset? That looks strawberry floating great Orange! And I haven't watched that video yet Starquake but the thumbnail says it all! Congrats! Starquake wrote: What drawing software are you using for the tileset? Take a look at Pyxel Edit. It’s pretty good for tilesets and exports as a tileset file or pngs. I've not tried it out yet but Pyxel Edit definitely looks good, and it just helped me stumble upon this cool tutorial for sub-pixel animation too! I went overkill on the dithering. Gotta get that sandy texture. It looks nice. What are you developing it for?